In April of 1995, photographers Joe and Monica Cook set out on a canoe voyage down the Chattahoochee River – from the headwaters to the Gulf of Mexico – that would take them 100 days, 163 rolls of film, 32 pounds of trail mix, and four bottles of sunblock. It would also reveal the spectacular beauty of one of Georgia's most cherished natural treasures, as well as many grave problems the river faces as one of the state's most important resources. Atlanta Journal-Constitution columnist Lee May narrates. 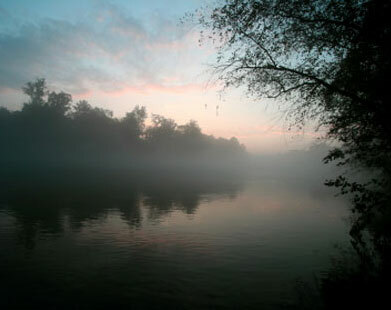 At the start of the Cooks' journey, the Chattahoochee flows through remote mountain forests. But it isn't long before they leave U.S. Forest Service land and enter land through and around Helen where property values have doubled in the past 10 years. "We saw a lot of construction – especially along the river," notes Monica Cook. "We didn't have a day when we didn't hear hammers or saws or something in the background." As the Cooks approach Lake Lanier, the program explores the history of the lake as well as its various uses – from recreation and hydropower. It also looks at wildlife in and around the river, including trout and caddis flies, and examines the effect of construction and run-off into the river on the Buford Trout Hatchery. Interviews with the 630-home Chattahoochee River Club developer Don Donnelly and environmentalist Rand Wentworth, Atlanta director for The Trust for Public Land, illustrate the relationship between developers and environmentalists along this stretch of the Chattahoochee. A delicate balance must be negotiated between economics and ecology. A new 80 acre park near the Morgan Falls Dam provides a buffer that can filter out silt from construction sites and pollutants from lawns and roads. This is one of the Trust for Public Land's successes. Donald Mitchell, chief soil and erosion inspector in Fulton County, compares his job to "dropping a bucket of golf balls on a driveway and having to pick 'em up before they hit the street." Erosion into creeks that feed the Chattachoochee is even more severe a problem than direct run-off into the river, as creeks are rarely as protected as the river. Chattahoochee River examines the efforts of Mitchell and others, such as Sally Bethay of the Upper Chattahoochee River Keeper, to educate and put into place management measures to lessen the impact of erosion on the wildlife of the river and its tributaries. It also takes a close look at Atlanta's 60-year-old R.M. Clayton wastewater treatment plant and the need for upgrades there. South of Atlanta, the Cooks are surprised at how peaceful the river becomes, despite the fact that it's the most polluted stretch. "It was the first place that you didn't have houses lining the banks of the river," Joe notes, "People don't want to live near a smelly river ... so you don't see the development you do north of Atlanta." As the river flows southward, the Cooks encounter a historic part of the river, and the program outlines the history of an old textile mill on Sweetwater Creek in New Manchester, as well as the Native American past of the McIntosh Reserve. They encounter more visible evidence of pollution just past Franklin in West Point Lake, and the documentary describes the lake's struggle to control phosphorus levels. 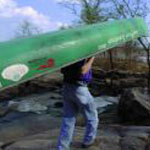 After arduously carrying their canoe around nine dams down river of West Point Lake, the Cooks reach Columbus. Here, a successful riverwalk has made the most of recreational potential along the river. 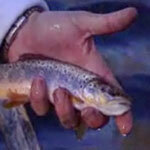 The added benefit is improved water and sewer systems and larger fish populations. Finally, the program follows the Cooks into southwest Georgia and Florida and looks at the ecological health of Lake Seminole and Apalachicola Bay. In presenting their slide show across the state, the Cooks hope to increase understanding of the watershed and our link with the river. "There's no better way to learn your connection to the river than to actually get out and travel for any distance on it," says Monica. Joe adds, "there's all sorts of beauty out there." Chattahoochee River is made possible through a generous grant from Interface, Inc. – working to provide sustainable product and service solutions for commercial and institutional interiors worldwide.